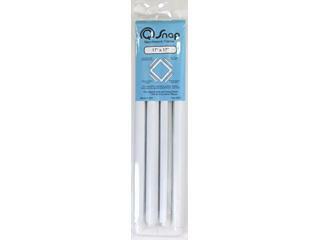 Q-Snap Frames are made from PVC tubing making them lighter and more durable than other materials. The clamp design for holding the fabric is gentle and simple to use. Just lay the fabric over the frame then gently push the clamps down stretching the material around the outside of the frame. The ribbed inner surface of the Q-Snap clamps hold the tension for your preferred adjustment. Simply turn the clamp outward to tighten or inward to loosen. Extension Kits: Extend a frame using these kits! You can extend an 11x11 inch frame to 14x14 inches or a 17x17 inch frame to 20x20 inches.